Author Mary Gilmartin’s Effervesent Website! When Mary Gilmartin strolled into my Evening at Emory Creative Writing Class, two years ago, with that effervescent smile and sparkling personality, I knew she was destined to be a successful novelist. What impressed even more was her personality and how she interacted with the people in the class. I knew she could be creative in marketing her novels. Well, I wasn’t wrong (smile)! Mary’s new book, Adventures with Easton, is published, and she has created a sparkling website, with a little fizz on top, that reflects that infectious personality. For Example, at her recent Books for Less/Mall of Georgia book signing, she captured the experience by including some fantastic photos. Check out the Spiderman balloon on the home page of her website. Also, the photos of Mary interacting with children, young adults and adults with that smile will bring her many book sales. 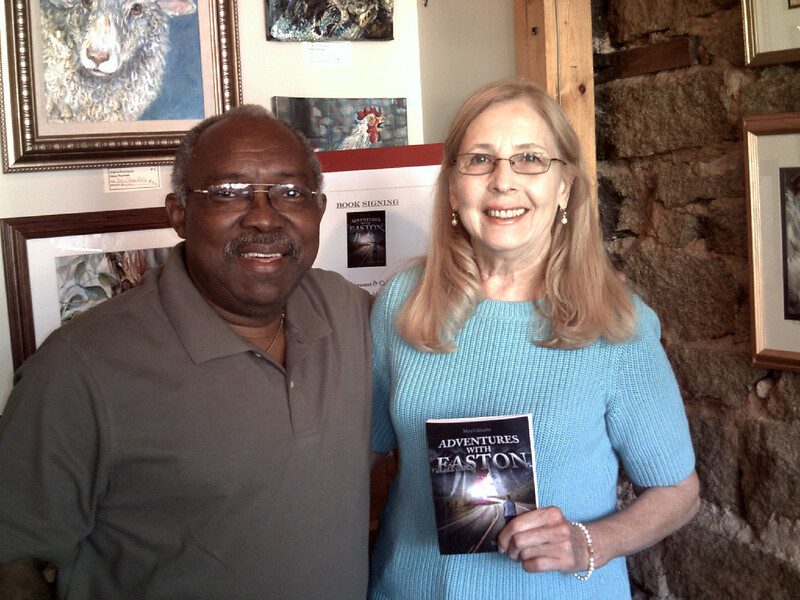 Mary showed that same winning personality, on Saturday June 2, 2012 at the Artisan Restaurant in Historic Stone Mountain Village, at the debut of her novel, Adventures with Easton. It is the story of a young boy who overcomes his adversities through his dreams and friendships. In Mary’s book you travel into a magical world created through the eyes of a nine-year-old. This is the first book in a trilogy. At that book signing, Mary was beaming as she autographed copies of her book and talked about her writing career. Please visit her website, www.MaryGilmartin.me, and experience Mary’s bubbly personality. Purple Phantoms’ debut Labor Day Weekend at 2012 AJC-Decatur Book Festival! I want to thank you for attending the debut of my fourth novel, Purple Phantoms.Sometimes, you meet people who affect you and encounter experiences that change your life. When that encounter is with a young person, it is more intense and emotional. As a high school varsity basketball coach, I experienced the death of several basketball players.A dramatic example was my ninth-grade rising basketball star. He had a tremendous future and was killed at fifteen. He was riding with an older cousin, going to a pickup basketball game, and when the cousin passed a car and a cement truck was barreling down the two-lane high way. This tragic event and several others affected my life as a coach, a teacher and a person For years I kept these events in the back of my mind. When I finished writing the Julius Thompson Trilogy: A Brownstone in Brooklyn, Philly Style and Philly Profile and the national award winning Ghost of Atlanta…I knew it was time to tackle Purple Phantoms. The death of young athletes was the genesis of Purple Phantoms: What if these young players could return for just one basketball season? The emotions of those tragic moments created a desire to make this book happen. As I was writing Purple Phantoms, I could sense a presence in my home office as I was typing the words, creating vivid scenes and watching the evolution of the carnival of characters come alive on the pages of this young adult novel. My former players lived again, played basketball on the hardwood again, sweated in games again and pulled readers in the moment of this young adult novel. Now…I could feel their presence again in the writing of this novel. I knew I had connected with the reader when I received a five-star book review from Readers Favorite, a national book reviewing company, that’s received wide-spread acclaim in the literary world. Wow, I’m still shocked at my second-straight five-star book review as the Gold-Medal winning 2011 Ghost of Atlanta received this honor. 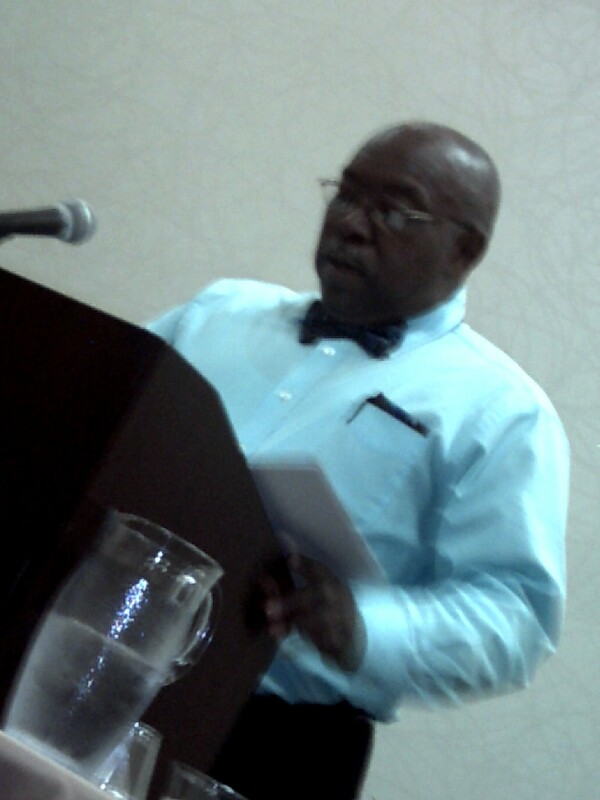 I will travel to the 2012 Miami Book Fair International to pick up the award for Ghost of Atlanta. Now, I’m writing my fifth novel, Chasing the Wind, which is taking up most of my writing time With the publication of A Brownstone in Brooklyn in 2001, I thought my novel writing days were over Now, four books later and I’m going strong in crafting novels. However, the crafting of a novel is never easy. There is character development with character resumes, scene construction, setting or the sense of place in a book, point of view, descriptive details, pacing, etc. The elements of a novel are daunting and must be conquered and woven together into a cohesive book that will grab and keep readers turning the pages. In Chasing The Wind, I want to explore how characters persevere over or destroyed by ever changing themes and events in their lives. I want to thank you for listening and please enjoy the Decatur Book Festival! Purple Phantoms can be purchased at my publisher’s website, Passionate Writer Publishing and will be on Amazon.Com any day! Now I’m open for a Q/A Session.